If you are seeking the Las Vegas experience but you want to save money, you want to have fun and you want to surround yourself with like minded vacationers the Stratosphere is right for you. You'll save money, you'll be pleased with the entertainment and nightlife options and you can still see the rest of Las Vegas knowing you paid far less for your room. Is this the right Las Vegas hotel for you? Check out our choices for the right Las Vegas hotel for you. If you have stepped into the Stratosphere before you might have an idea of what you should see, however, they have revamped the property so you might be surprised that those qualities that you enjoyed have been enhanced and the little things you disliked, well, they are either improved or gone. The casino looks roomier, cleaner and well lit. A large portion of the rooms have been remodeled and they can now compete with most of the mid range hotels on the strip. The view from the tower is still insane and the Top of The World restaurant now serves food that will make you forget about the view. Happy hours, fun lounge atmosphere and the attractions. The Stratosphere has all the elements of fun that you should be looking for in a Las Vegas vacation without the crowds of the mid strip resorts. Level 107 Lounge is worth a visit for the drink specials and the way you can see the sun dip beyond the horizon. Bring a camera. You’ll also enjoy that the cost of a room at the Stratosphere is way less than most on the strip. 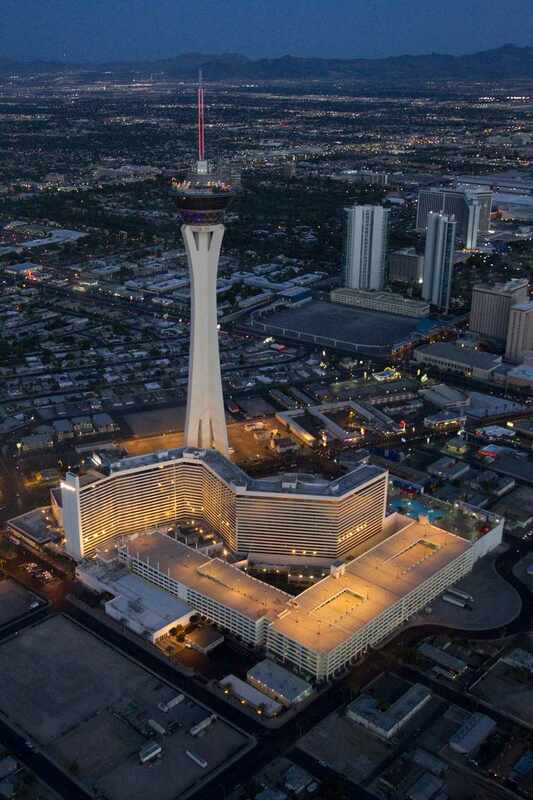 It’s no secret that the Stratosphere is way down on the North end of the Las Vegas strip. Yes, it seems so far away that you might be inclined to overlook it. However, a cab ride to City Center is about $10 but you can take a 7 minute walk to the SLS Las Vegas and hop on the monorail. You can walk to the Wynn Las Vegas in about 15 minutes. Consider how much you save on room rates and you might find that it is worth it. At some point you will be going up to the top of the tower and scaring the demons out of your soul. It will happen, so before you do that head to the C Bar and take advantage of their Happy Hour or try lunch at Top of the World restaurant. Both of those experiences will have you considering making the Stratosphere hotel part of your Las Vegas vacation plans. Whatever you do attempt at least one of those rides on top of the tower just to say you did. The hotel has over 2000 rooms and the new Stratosphere Select Rooms are very nice. You’ll be able to put on a bathrobe after soaking in the oversized tubs with those jets that make you feel bad about not having a Jacuzzi back home. The rooms are slightly smaller than average on the strip but you’ll hardly notice that since they have done a good job with the furnishings. The new restrooms are large enough that you won’t feel cramped and the beds are as good as any on the strip. Compare hotel rooms in Las Vegas with more pictures. You'll still need a few more places to have a good time in Las Vegas, Check out our where the party is at in Las Vegas. So when should you visit Las Vegas? Check the weather in Las Vegas and start making your reservation. Start planning your trip to Las Vegas by researching prices with Expedia.com and Southwest Airlines Vacations. They should give you a good idea of what you can expect to spend on a Las Vegas vacation.